How do you get the most out of your equipment and increase your OEE? In the world of F&B, investment budgets are tight and ROI is carefully assessed, especially for CAPEX heavy projects. At the same time, companies must meet expanding demand in areas such as APAC to capture market share. Everyone is asking – how do you get the most out of your existing equipment while keeping investment costs low? How do you improve throughput and yield without additional investments that will eat into already thin margins? Lean management principles and digital transformation of the continuous improvement process provide a solution. Digital tools that measure, visualize and analyze the factors driving operational performance enable gain greater visibility into companies’ processes. This allows businesses to empower individuals and teams to identify inefficiencies and streamline processes to minimize time, effort, and waste. 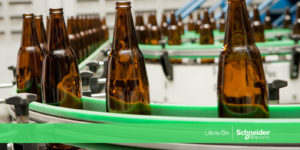 This is more than just theoretical – New Belgium Brewing decreased downtime by more than 50% using a digital performance management solution which provided increased visibility into downtime causes and insight into how to optimize their operations. Companies can boost their equipment utilization and overall operational performance by implementing monitoring and measurement of KPIs such as Overall Equipment Effectiveness (OEE). OEE is a powerful metric that is calculated from actual equipment availability, performance and quality losses. It captures when an asset is available, the speed at which it operates and the products out of quality specification. Measuring and monitoring OEE is a good starting point, but to gain true value from digital transformation, a more sophisticated approach is needed. It’s necessary to add operational context to enable root cause analysis, so operators can determine the causes of unscheduled downtime. Advanced performance monitoring solutions go beyond OEE for a full dive into how production logistics and planning, quality operations or maintenance activities may impact the performance of manufacturing operations. These solutions combine OEE monitoring with equipment utilization state tracking and advanced analytics. Adding work order management and manufacturing execution tracking to the picture provides a clear categorization of unplanned downtime vs product changeover or idle time. In addition, monitoring production line OEE requires validating the product flow across individual line equipment. This naturally leads to a focus on line bottlenecks. That holistic real-time view of efficiency and performance, with accompanying analytics, empowers users to take corrective action to fix issues. This information also helps identify inefficiencies, which can help drive operational change across entire functional domains and organizations. With cloud technologies rapidly advancing, cloud-based solutions are another item to consider when exploring performance monitoring. There are many benefits to hosting these capabilities in the cloud, whether as a fully cloud hosted deployment or as a hybrid cloud solution where specific applications and mission critical MES functionality continue to run on premises – but historical data is loaded into the cloud. A cloud-only performance management application can be more feasible to meet the ROI expectations of plants. This is especially true for plants with less complex processes and lower levels of automation – while the IT footprint and total cost of ownership of an on-premises solution would not pay off, a cloud deployment is economically feasible. Hosting performance management and data storage in the cloud also means the solution can connect people and systems anywhere. These systems are extremely scalable, allowing a performance management approach covering multiple sites across the globe. With plant and equipment data coming together in the cloud, side-by-side comparison of equipment efficiency is naturally much easier. Companies can compare extensive process data with corporate performance data, advanced analytics and artificial intelligence. This process makes it possible to identify and share best practices with more sophistication and on a higher level. Whether OEE monitoring and measurement is hosted on-premises or in the cloud, digital transformation of the continuous improvement processes can provide serious benefits to overall operational performance, allowing F&B companies to get more out of their existing equipment. Learn more about how OEE monitoring can transform your business. Well said. I would like to add a few points regarding OEE and predictive maintenance. We have risen from the point of reactive to predictive maintained and innovating new technologies is making it better day by day. Internet of things, e-maintenance systems, Downtime tracking software utilizing advanced algorithms and machine learning all these factors require more innovation and they are rapidly enhancing the effectiveness of decision making.